Spinning is use to create yarn from raw materials. You can use all sorts of materials but usually natural materials, such as the wool from sheep, are used. We recommend you start with a drop spindle. Drop Spindles are inexpensive to purchase and easy to make. You can also buy a beginner spindle from the The Woolery.. Spinning wheels are a lot of fun and sometimes people just want to start out with a spinning wheel. ​Most people do well starting with a double treadle. For many of us it allows us to spin slower which is a good thing when you are a beginner because your hands are still learning. ​Once you figure out which wheel you like the best you can purchase them online easily at Bountiful Spin & Weave, Pacific Yarn and Fiber, The Woolery, and Village Spin & Weave. If you still want to spin and can't find a spinning wheel that fits your body, consider an electric spinner. There is an inexpensive one called the Electric Eel. It works well but is loud. The price is great. A really fantastic whisper quiet electric wheel is by Hansen called the mini- spinner. ​Three Bags Full will teach you how to get the Fiber ready to spin. ​The Gentle Art of Plying will help you learn to put the singles into a lovely yarn. ​Or come to a spinning meetup. See the resources page for additional ideas for books, videos and web sites. Weaving uses a loom which can be small enough to sit on a table or large enough to fill a small room. You can learn to weave through books, DVDs, hands on instruction or all of the above! There are so many ways to start weaving that is it mind blowing. ​Triangle or Continuous Strand Weaving is really easy and uses a very simple loom. Las Aranas has one that you can rent. You can start weaving in minutes as the loom warps itself. ​Hill Creek sells lovely Triangle looms or you can make one yourself. ​Here is a good video about the technique. This one by Hazel Rose a little easier to see, she uses a much smaller loom than I have but the technique is the same. ​Rigid Heddle Looms are another easy way to start weaving. You need to warp this loom but fear not Rigid Heddle looms are easy to warp. For many people this is a step before using a four shaft loom. A rigid heddle loom is kind of like a 2 shaft loom. With direct warping you can easily warp your rigid heddle loom in an hour or less. There are tons of great books on rigid heddle weaving.. just search on amazon. Craftsy also has a class on Rigid Heddle Weaving. ​Inkle loom Weaving: This has a lot in common with a rigid heddle loom. It is great for weaving guitar straps and belts. One of our guild members Annie MacHale is a wonderful Inkle loom weaver and a great resource for this type of weaving. Her web site is here. If you join the meetup group we meet at her house once a month. ​Four (or more) Shaft Looms. It is really helpful to take a class before tackling a four shaft loom but if you have no instructors near by or cannot fit that into your schedule.. fear not. You can learn to warp a four shaft loom on your own. Weaving on them is a ton of fun. There is nothing as cool as throughing that boat shuttle from one end to the other. 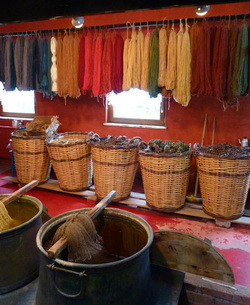 Get a floor loom if possible.. the shuttle throwing and the treadling is a great deal of fun. There are different types of floor looms, Jack Looms, Counterbalance looms, Countermarche looms. You can learn on any of these but as a beginner weaver I have found that most American books are written for Jacks looms.. I think they are easier to learn on because of that. Consider renting one of the Las Aranas looms or borrow a portable loom from another weaver. Many guild members have a portable workshop loom that they would be happy to lend you.. most workshop looms are Jack looms. Also spread the word that you are looking for a loom. If you know what you want to weave that helps. The guild members are wonderful at helping you locate a fantastic deal on a used loom. With a used loom you can save 1000's of dollars. ​My first loom was a counterbalance loom and I found it frustrating that everything I read was written for jack looms but I toughed it out and now I love this loom and still use it. 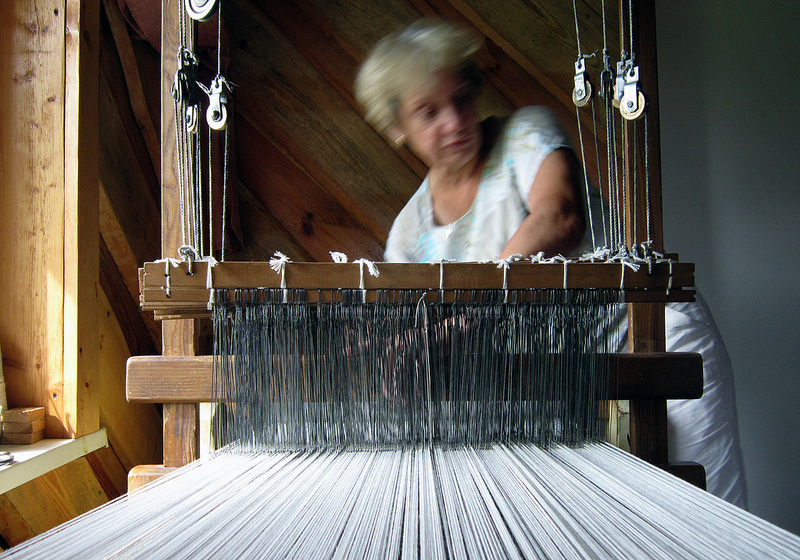 Counterbalance and Countermarche looms were recommended to me because I wanted to weave rugs. This was a good recommendation because they are usually sturdy looms. My first sampler on it and I fell in love and now want to weave dish towels.. blankets.. scarf's. ​Beginner Four Harness Weaving by Deb Chandler.. goes well with her book "Learning to Weave"
​Warping your Loom by Madelyn van der Hoogts from Interweave is a lovely DVD. ​Peggy Osterkamp has wonderful Weaving Books and DVDs. ​Just jump in and give it a try. At first your selvages might be uneven but with practice you will get better and better... and oh what fun you will have. Save some extra warp to experiment. Try different yarns.. try different treadle patterns.. just play. ​Saori Weaving is another kind of weaving that involves just playing and trying different yarns and textures. ​Join our guild.. and most importantly get over the fear of warping! It is not that bad and will actually become fun! Join Las Aranas or at least come to a meetup sometime. We have spinners, weavers, knitters, needle felters, crocheters.. all types of fiber artists. Las Aranas information can be found here.. meetup information here.